Hoshangabad lies in the heart of the nation, on the northern bank of the Narmada River. The place achieves quite a remarkable place in the history of the nation as well as the state. Initially named as Narmadapuram, derived from the name of river Narmada, it was subsequently named after the ruler of Narmadapuram, Hoshang Shah as Hoshangabad. Ever since, the city is famous for its beautiful natural, spiritual and scenic distinctions attracting a huge number of tourists every year. Satpura National Park is considered among the unexploited wildlife sanctuaries of India. It was set up initially with the motive of conserving the tigers. The park has rugged terrain and comprises of deep valleys, waterfalls and narrow gorges. Moving around the park you should not be surprised to witness sandstone peaks, thickly dense green forest of Sal and the vast Tawa reservoir. On visiting Satpura National Park, tourists are sure to have the opportunity of watching Spotted deer, porcupines, tigers, leopards, marsh crocodiles and many more wildlife. Unique attractions include Black Buck and the Indian Giant Squirrel. The national park also has a wide number of birds which are wonderful to watch. It is the only Tiger reserve in the whole of central India offering Nature Walk. A group of 4 visitors are allowed to walk inside the tiger reserve, of course with a trained wildlife expert ensuring their safety. The best time to visit this park is between January and June. 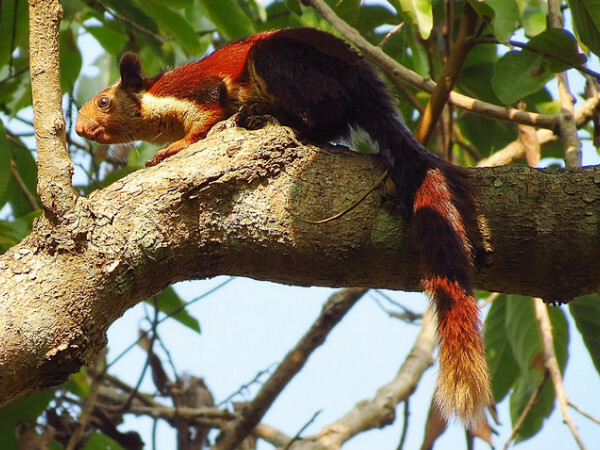 View of the Giant Indian Squirrel. Ramji Baba Samadhi is one of the major attractions of Hoshangabad. The Samadhi contains the shrine of Ramji Baba, a well followed saint. An annual fair hosted by local people at the Samadhi goes on for about a month. The Samadhi is visited by a huge number of devotees from near and far off places. Ramji Baba Samadhi is the epitome of maintained spiritual value among the residents of Hoshangabad. The visit to the Samadhi by people in a huge number, shows the presence of widespread followers of Ramji Baba not only across the state but also across the entire nation. Hence, a place of profound spiritual importance, Ramji Baba Samadhi increases the beauty of the city of Hoshangabad. By Air: The nearest airport to Hoshangabad is the Raja Bhoj Airport, located in the state capital, Bhopal. It is well connected with all the major cities from here. By Rail: Hoshangabad has its own well maintained railway station with a good frequency of trains. The Hoshangabad Railway Station is located in the heart of the city. The place has a good connectivity of rail lines from all major cities of Madhya Pradesh. By Road: Hoshangabad is also well connected to all major cities of Madhya Pradesh through a network of good roads. Since, its location is not very far from the capital of Madhya Pradesh it is convenient to travel by road. Visitors can hire a taxi or board a bus to reach the city.